Ah, Book Lovers Day—a day to celebrate the love of the written word. While many of us are book lovers every day, the Free Library wouldn’t miss the chance to officially celebrate. Return to the inviting story of an old favorite. Dive into that mystery that you remember being glued to as a child. Pick up an electric romance, reminiscent of all of the television shows that you cite as so-called guilty pleasures. Embark on a journey with a complicated hero who you get irrationally aggravated with, but also root for until the end. Or, just finally pick up that book that’s been gathering dust on your shelf. You know the one—that book that you’ve been meaning to read, but just "haven’t gotten around to." Well, now’s the time to at least start it, my friend … I mean, it’s been sitting there for three years! Of course, what you’re reading is absolutely important. But, as a book lover myself, location and atmosphere are also factors in concocting my perfect reading day. Even during these dog days of summer, fall will be here soon enough, so I’d love to share some of my favorite spots—season to season—so that you’ve got some options for the rest of the year. The sun is high in the sky, the daylight lasts until late evening, and the heat sticks to us like saran wrap. Even though it might be hot out, nothing sounds lovelier than taking a blanket to your favorite park and spreading it out under a tree. Lean your back up against the trunk and get ready to bury your nose in your book while also being surrounded by the fun of summer. Hey, if you’re lucky, maybe there’ll even be a breeze. I do recommend bringing a bottle of water or an ice-cold glass of lemonade, and maybe even a refreshing snack like watermelon or grapes. Make a nice morning or afternoon of it. The leaves begin to float down and you find yourself fishing out your well-loved sweaters. When I think of fall, I remember the coziness of going inside after being faced with the crisp air. Grab your book of choice and curl up in a café or coffee shop. Enjoy a hot, flavored drink or a cup of hot cocoa that’ll warm you down to your toes. The atmosphere of a coffee shop allows for you to be around the buzz of people, but also allows you to do your own thing. This is, without a doubt, one of my favorite spots to read—there’s nothing like getting lost in a story and realizing how it can transport you to a new place, no matter where you are. Don’t go anywhere. Suddenly, the weather has turned way too cold. Stay home. Put on your comfiest pajamas and wrap yourself in your warmest blanket. Make a steaming hot beverage. Eat some soup. Plop down on your couch—by a window, by the brightest lamp, by the fire—wherever there’s light and it’s extremely comfortable. Read. After a (probably) too-long winter, go embrace the budding trees and blooming flowers. Like summer, you can go read in a park, but this time, enjoy the fresh floral smell of spring and that rare perfect temperature. If you’d rather stay inside, read by an open window. If anything, stay by natural light—there’s nothing like being able to read by sunlight filtering through your window after a long winter. Now, onward, book lovers! Grab your book (or find one in our catalog) and find your favorite spot. 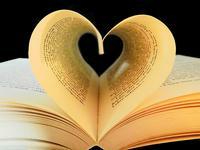 Book Lovers Day—a day to celebrate the love of the written word! Add a Comment to Happy Book Lovers Day!